First let me say that I don't consider myself to be an "expert" on much of anything in numismatics, but I do collect this series and hopefully can offer at least a few interesting insights which some of you might find helpful. That said, if any other experts out there want to add or correct anything in this post, I welcome it! Now to the discussion. A lot of you may look at the title of this post and say, "what the heck do I need to know about Saints?" You may not collect them, may not even own one, and certainly may not have any desire for completing a set of them, and that's ok! There are a lot of lessons however that can be applied to other gold coins or other non-gold series as well. For those of you interested in Saint-Gaudens' double eagles, the first thing you should do is read, read and read some more. There are two main books I would recommend at a minimum to learn more about this series. The first and most important is David Akers' book entitled, "A Handbook of 20th-Century United States Gold Coins 1907-1933." This book published in 1988 covers not just double eagles, but Indian quarter and half eagles and Saint-Gaudens' eagles (aka Indian eagles). It's a short book, under 200 pages (much easier to carry than Overton's 600+ pages) and it devotes a couple pages to each issue for each series, making it a superb reference for date collectors. These write-ups contain the relevant base data, as well as excellect commentary for each issue. The second book I would recommend is the Red Book "A Guide Book of Double Eagle Gold Coins" by Q. David Bowers. This book covers just double eagles, from Type 1 Liberty through Saint-Gaudens' issues. This book is nice, but somewhat less detailed than Akers, with less commentary on typical strike characteristics, luster and other factors to look for with each date. Still it makes a fine reference if you are unable to locate a copy of the Akers book. Ok, now that you've read through these books, you are ready to get out your checkbook, right? Not quite. First, ask yourself why you want to buy a Saint. Do you want to collect them by date? Put together a year set? Add them to your type set? Or do you just want to buy some gold? All of these are common reasons, and they are pretty good reasons (though if you only want to buy the metal I would encourage you to buy gold eagles or maple leafs or a gold ETF). If you are planning on putting together a date set or year set, be prepared for a long road ahead. By definitition, there are probably enough coins for maybe a dozen or two complete date sets excluding the 1933, which makes it almost impossible for most collectors. Still, that shouldn't stop you from trying if you like! A year set is a little easier, especially if you cut it off at 1928 instead of 1932. As a set collector, before you buy a single coin, look. Look at as many coins as you can, raw coins, certified coins, coins at the Smithsonian, look whenever you have the chance. The more coins you look at, the more you will quickly realize how different each can be. There is not just variation from year to year, but between the various mints within each year. This is somwhat like a miniature version of what Bust half collectors deal with in various die varieties and states (though with so many fewer varieties it's easier for a guy like me to get my mind around). As you see more examples you will also learn what to expect for individuals and how to spot the true gems that may be overlooked by others. It will also help you to more easily identify coins that might not be origina (see Tom B's post last week). For many collectors, they see a gorgeous high-relief Saint, and may assume that they all look like that. I wish that were true. After the relief was lowered in 1907, these coins became the workhorse for the US balance of payments under the gold standard. These coins were currency, but also a source of financial reserves and a way to settle international payments (i.e. why so many ended up in European banks). They were produced by the millions, and as such look like coins with millions minted (even if most were melted). For example, the common Philadelphia issues of 1927 and 1928 are almost universally well struck, with sharp details and a more subdued luster (almost a matte finish). The 1915-S is also a common date, but typically doesn't display the bold stike of a 1928, but also has a real flashy luster (like cartwheels on a Morgan dollar). Compare these two to the less common 1911 which is usually well stuck, but almost always has sub-par luster. So, when you see a rather dull looking 1928, you may not be willing to bid as agressively for it, while if you see a 1911 with brilliant cartwheel luster, you can be almost certain the surfaces are not original. Along with luster, color is an extremely important characteristic often overlooked. Although these coins are minted of non-reactive gold, they are not pure. At 0.900 fine, the copper alloyed with the gold is quite reactive. Saints do tone, though certainly not the rainbow patterns you see on silver (thank goodness there will be no "Saintgate" as we've had over the last few weeks!). Generally this toning is referred to as coloration on gold coins, ranging from orange-gold to reddish-gold to green-gold. Often color varies by issue depending on the alloy employed and whether the copper is evenly distributed on the surface. Again, the Akers book is a solid reference on expected coloration on each issue. Finally, a word or two on copper spots. These are generally unattractive spots that develop on the surface of pre-1933 gold that look almost like rust. These can be conserved (a question I reserve for our friends at NCS), but as a general rule I would just avoid coins displaying copper spots. In most cases there are other examples out there, so just avoid the problem to begin with. As for strike characteristics, there is no FH, or FBL or FB for Saints, but there are some areas to look at to guage the quality of the strike. On the obverse, look at the torch, particularly the flame, as well as the fingers on the torch hand, look at Liberty's toes, look at the hair and look at Liberty's face (i.e. does she have a well formed nose and mouth, or does she look like a mutant pig?). On the reverse, look at the feathers on the base of the eagle's beast. As you get to know the strike characteristics for each issue, you will know what to expect, such as the weak, mushy strike of the 1924-S (so if you see one with s super sharp strike, look to see if the mintmark was added). Wear on a Saint like all coins starts at the high points, liberty's breast, leg and knee and the eagle's breast on the reverse. It can be very difficult to differentiate wear from a weak strike, though it's often helpful to know the issues strike characteristics, as well as looking to the fields and rims for evidence of circulation to confirm wear over a weak strike. Bearing in mind that these coins seldom circulated, there is a tendancy to assume apparent wear on the high points is just the result of a weak strike, though a well informed collector will have a reasonable basis to conclude whether a coin is circulated or weakly struck. Another important point here is that gold, being a soft metal is not very forgiving. As a result, contact marks can be much more pronounced, and create real distractions in the fields that hurt the eye appeal of otherwise beautiful coins. Also keep in mind when looking at enlarged photos, the camera tends to make minor marks on these coins appear much worse that they likely are in hand, so don't discount potential acquisitions based solely on enlarged photos. Grading of Saints like all coins is subjective, but there are some factors peculiar to 20th Century gold that affects grading. Despite the seemingly high mintages of the series, most were melted in the 1930s as a result of FDR's executive order prohibiting the hoarding of gold specie. Large numbers of some issues survived (such as the common dates of Philadelphia from the 1920s, but some are quite scarce or rare. As a result, the grading of some of these scarce dates can be somewhat looser than with common dates. In addition, there are individual strike and luster characteristics of each issue that cause grading for the series to be inconsistent. For example, a 1928 in MS-65 will generally look a lot different than an MS-65 1911-D. This can actually be of benefit for acquiring common date coins in a date set, or individual pieces for a type set, as you can be much more selective in choosing a common date specimen within a particular grade. When it comes time to make a purchase, I would buy only coins certified by a top TPG, such as NGC, PCGS, ANACS or ICG (I know there will be debate on this one, but they don't do such a bad job with this series). Until you are confident in you grading skills with the series, and more importantly your authentication skills it's worthwile to buy certified coins. There are a number of fakes out there, from bad ones like the 1919 Saint I once saw on eBay to high quality numismatic fakes. Once you are prepared to purchase your first or only coin, I would first choose a date you'd like to purchase. By selecting and focusing on say a common 1915-S, you will be able to focus only on the characteristics of that date and be better able to choose the best possible coin in the grade desired. As for the grade, I follow a general breakpoint rule, purchasing the highest grade possible before a significant jump in price. For instance, the 1920 is a better date, relatively common and available in grades up to MS-63. The price difference between MS-60 and MS-63 might be $300-400, so it's worthwile to spend the few hundred dollars to get the MS-63. However, in MS-64 the price jumps by a few thousand dollars, from say $900 to between $3,000 and $4,000. Given the subjectivity in grading, I would prefer a solid MS-63 specimen over an average example one point higher that may have been cracked out and resubmitted a dozen times to garner the extra point. I use this method for most of the coins I collect, given my limited resources. This is an appropriate starting point for a new collector to this series. Once you are experienced, if you have the means, you can always spend the money to upgrade. As for which date to start with, I would choose what I like to call the better common dates (this is expecially applicable to type set collectors). The most common Saints are 1924, 1927 and 1928, and this is where most collectors (including myself) start. To learn from my mistake, if I had it to do over again, I would have started with the common dates in the teens, simply because the P-mints of the 1920s are so available! There have been hundreds of thousands of these coins graded, so they will almost always be available. Look at coins like the 1914-S or 1915-S, these issues are common, but they are better common dates than a 1924 or 1928. They typically are attractive like the 1920s issues, but they are just a bit better, and chances are when you go to upgrade and want to sell your 1915-S, the dealer may not roll his or her eyes like they would after seeing the 197th 1928 Saint someone wanted to sell them that day. The 1907 is another great coin for a start to a set or for a type collector. If you need a "no motto" issue, there are tens of thousands of 1908 NM available. The 1907 NM is still pretty common, available for a $100-300 premium over a comparable 08 NM, but so much better for holding value, as it's the first year of issue and such a famous date in this series thanks to the HR coins! As you get further along in your collection, I encourage you to think outside the box as you choose which dates to pursue. I like to buy coins that are overlooked in the market. For example, 4 or 5 years ago, the 1916-S was virtually ignored, and placed in the common category with the 14-S and 15-S, after all, Akers ranks it 46th in the series, behind right behind the 45th place 14-S and 44th place 15-S. Well what jumped out at me, was for a "common date" it was not all that common at shows, auctions or dealer cases. So I bought that coin while I thought it was undervalued (priced about the same as a comparable 14-S or 15-S) and today it sells for a premium to those two dates. I would also encourage you date set collectors to take advantage of the key dates when the opportunity arises. Some of the branch mint coins of the 1920s are very hard to come by, so if one comes up for auction or sale in a grade within your budget, don't be afraid to jump on it! These coins will always be scarce and worth a hefty premium to the common dates (new European or Central American hoards are becoming ever more rare). So that's my view of Augustus Saint-Gaudens' double eagles. They are perhaps the most beautiful coins ever produced by the mint, and a coin every collector should own (at least one!). Pursuing a set may seem like climbing the mount everest of numismatics to many of us, but that doesn't mean it's not worth a trip to Nepal to at least see it! Please add any other tidbits I might have forgotten, and I'd be happy to discuss specific dates/mints in detail if anyone is interested. Thanks for reading, sorry it was so long! I don't collect gold, but your writing makes me want to go out and get a copy of Akers' book and read up on these issues in case I spring for one. Great post, Jeff! I had been looking to buy one of these coins for my type set, so this info is great! Jeff: This is a good write-up with good information for the person not owning or not collecting Saints. There are additional intricacies of grading, of course, but newcomers should look at examples of each date that they are considering buying. They do differ dramatically from year to year and date to date. Part of this (for all US gold) is the source and color of the gold used to mint the coins. Colorado gold is a different than California gold, is different than Nevada or Utah gold........ The toning colors can be yellow, greenish, pink or redish, depending on the mine and smelter. Charlie, I agree wholeheartedly! It's important to realize then that even a complete set, in identical grades will not have a uniform appearance, certainly not as uniform as a state quarter map! But that is something to consider especially for type collectors. If there is a certain look to a gold coin that a type set collector wants, they should look for dates and mints that share those characteristics. Knowing the particulars of each issues' color also helps to more readily identify coins with altered surfaces as well. great post.... These boards have really become a great place to learn in the last few weeks. The first and most important is David Akers' book entitled, "A Handbook of 20th-Century United States Gold Coins 1907-1933." This book published in 1988 covers not just double eagles, but Indian quarter and half eagles and Saint-Gaudens' eagles (aka Indian eagles). It's a short book, under 200 pages (much easier to carry than Overton's 600+ pages) and it devotes a couple pages to each issue for each series, making it a superb reference for date collectors. These write-ups contain the relevant base data, as well as excellect commentary for each issue. That's really coincidental that you'd mention that, since I just came across two of those books and stuck them on half.com. I've also seen them on bn.com and amazon, but the price on those are pretty high. I'm not really trying to advertise, understand, just mentioning my surprise at the coincidence. That's ISBN: 0-943161-19-3 if anyone's interested. Saints do tone, though certainly not the rainbow patterns you see on silver (thank goodness there will be no "Saintgate" as we've had over the last few weeks!). Well, there are always exceptions! Thanks for posting that TDN, that is the most rainbow toned Saint I've seen (I've seen a few others that were much less pronounced). For most of us however, we could view thousands of examples before we ever come across a coin like that! Congratulations on a fine, well written article Jeff. Thanks Jeff for the great article. I've always wanted a Saint since my early years. Now I have an idea of what to look for. Again, a BIG THANK YOU to all of you experts out there sharing you knowledge (that I'm sure to years to acquire) with the less experienced collectors like myself. I look forward to this thread every week. IMHO, it's been played with in order to produce those colors. I've never seen another gold coin that looked like that. There are literally millions of people in this world that share a pssion for common hobbies, sports, etc. However, I cannot think of many groups of people so diverse and so williong to help others, as numismatists. This message board, It's members, and posts like these are what makes numismatics so great!!! Sure, our hobby has it's "players" and it has plenty of obstacles to overcome, but when I see a post like this... and there are many on this board... I give pause to realize what a special group of people we really are. I am glad to be a part of it. From the local to national shows, right down to these threads on the www I have met and learned from some of the greatest people that I will ever have the pleasure to know. Thank you.... It will always be my pleasure. Jeff, thanks for taking the time to write and share your knowledge of Saint-Gaudens Double Eagles, good reading offering lots to learn for those like me who have little experience with gold coins. I do have a few gold coins that I bought to put together a type set, but stop to work on my nongold types exclusively. Now I’ll have to dig them out from the back of the safe and take a look at them, I haven’t in a couple of years actually. I would agree, but I wonder why anyone would doctor a coin like that? It might be worth it for Morgan collectors, but for classic gold collectors it would first raise red flags, and still not generate much of a premium value (at least I wouldn't pay extra for it). It's for sale on ebay for $5k. $5K eh? You didn't show the obverse, but that might be a good price as long as it's a 24-D or 26-S or similar date! Nope - common date MS63. What's that - $500 without the toning? Nice write-up Jeff. I'll have to do that some day for the Indian Eagles. I've spent the last few days working like a mad man and working on taxes. Finally, I reached a break point long enough to read your substantial post, Jeff. It was fantastic recreation! Superb information and a great general basis to guide many collectors as they venture into gold (and other coins as well). Excellent! I've always thought that Saint of jom's was a lovely coin. More likely $650-700 with gold where it is, still a far cry from $5K! Unfortunately there will likely be some uninformed person willing to pay such a premium for it, hence the reason for my post! Thanks, Jeff. I learned a lot! 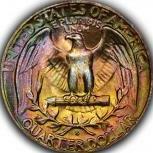 Thanks for the excellent post on Saint-Gaudens double eagles. One may need a bit more emphasis is authenticity. Collectors should be aware of is that the MCMVII high relief has been extensively counterfeited, as well as many of the other date/mint combinations. These range from good to excellent and the admonition to buy only certified examples from major third-party-graders is a wise one. A co-worker of mine purchased an MCMVII from a major coin dealer in the 1970s as an investment. He accepted the seller’s word of quality and authenticity. The piece is beautiful – too beautiful – it even has a little “beauty mark” in the shape of the Greek letter “omega” on the reverse. If genuine, this would be a $50k coin – as it is, it’s worth melt or curiosity value. I had withheld comment until seeing how other folks reacted - but that's only because I'm not a Saint collector, and have only ever owned maybe a couple. Now that I've re-read the article and been able to catch up with others' comments, I'd like to compliment you on a great article as well. I learned a lot, which is the purpose after all! RWB brings up a great point and a fascinating story. The Omega counterfeits are the most famous fakes in the series. I thought about bringing them up, but they could take up a thread by themselves. These counterfeits were only made from the high-relief double eagles of 1907, and they are of such extremely high quality that they've fooled countless experts and even the top-tier TPGs. I don't believe the identity of the counterfeiter (or artist, as some would argue) has ever been known publicly, but as most artists are wont to do, this person couldn't resist "signing" their work. In this case, it was a tiny greek letter omega placed right in the eagle's claw on the reverse (hence the name "Omega" counterfeits). I tried finding a photo on the net, but couldn't so if anyone can post a photo it would be great. As I recall from photos I've seen, the letter was placed in a way that matched the curve of the claw, so it was really unnoticable unless you were looking for it in particular. Once later iteration I've heard about are unscrupulous folks building on the Omega's quality, where they will try to remove the omega from these fakes, thus attempting to remove the one telltale sign of the forgery. Fortunately these folks have not been very good at removing the marks, so they've been caught by the major TPGs, but I've heard of them being slabbed by the lower-tier services as genuine. This is probably the most prominent example of a fake in this series, and a prime example of why it's best for collectors who are new or unfamiliar with the series to avoid purchasing raw coins, sticking with the top-tier TPGs only. Great article. I'm a comic collector from the CGC forums down the road, but have been having fun helping my brother decide where to focus his renewed interest in coins. I used to collect coins as a kid, and still love them. He's a budget collector, and in the past had focused on MS Franklins and Ikes. His budget has been in the $50-$100 range in the past, but wants to focus on quality over quantity this time. His budget would be about $500-$700 per coin, which would allow him to buy a coin every few months. He's decided that he would get the most enjoyment out of St. Gaudens. Why mess around? Just go for the best. His budget would limit him to the lowest MS coins and the most common dates, but I don't think there's any harm in that. I've forwarded him this post, as I think it would help him get started.